Ask questions, try out some words and actively produce them later. A conversation about the expectation of the story, if there are only a few pages read, provides material for an engaging exchange of thoughts. 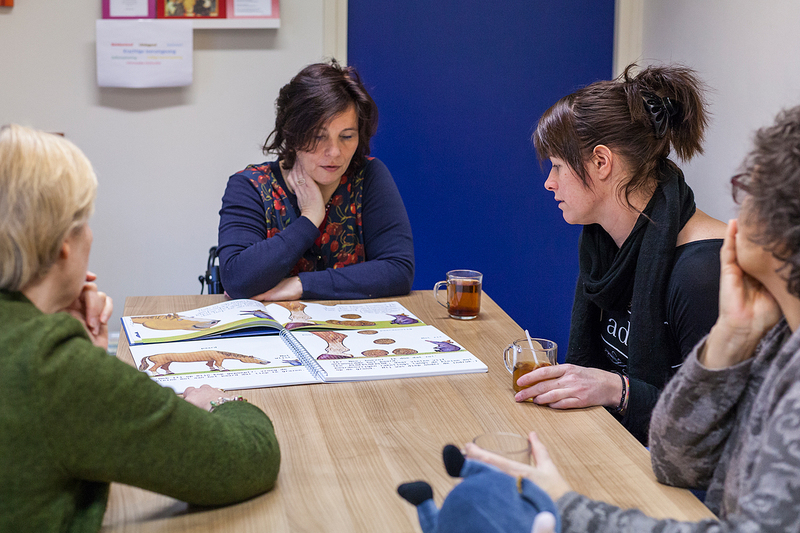 By reading picture books children come into contact with words they are not regularly exposed to in everyday life. This increases their vocabulary. These so called low frequency words are words that are primarily used in school books and in fiction. Picture books use predominantly low-frequency words. This makes this genre of great importance in preparation for reading comprehension. Reading picture books increases vocabulary, provides knowledge on genres and gives understanding of story lines. Besides these cognitive functions of stories there are two other functions, namely, the emotional and social. The emotional function is about a nice rhythm in the text or an appealing illustration. The social function lets you identify yourself in the main character, or even just the opposite. Picture books are of great importance in the development of every child. 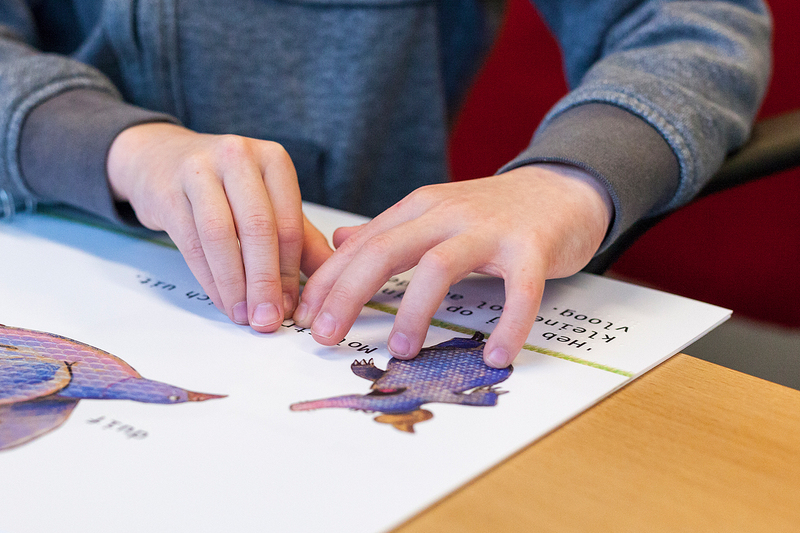 For PicturebooksPlus the language development of blind and visually impaired children is central. The method is a preparation for reading comprehension and preventing slipping or floating language. 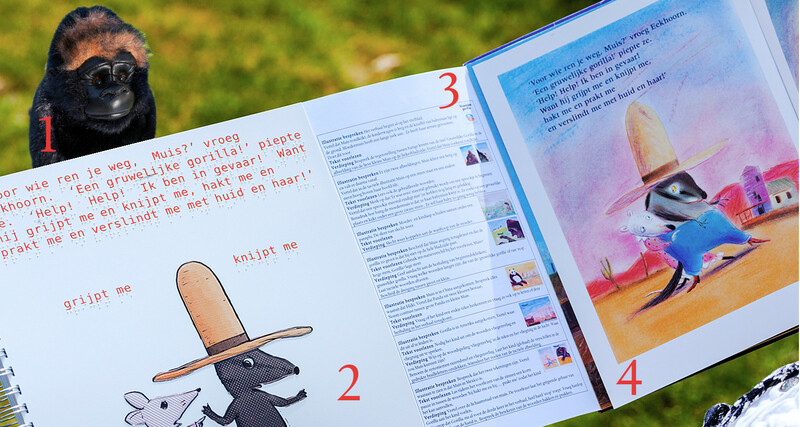 It supports and encourages interactive reading so that children can explore the rich world of illustrated story telling. 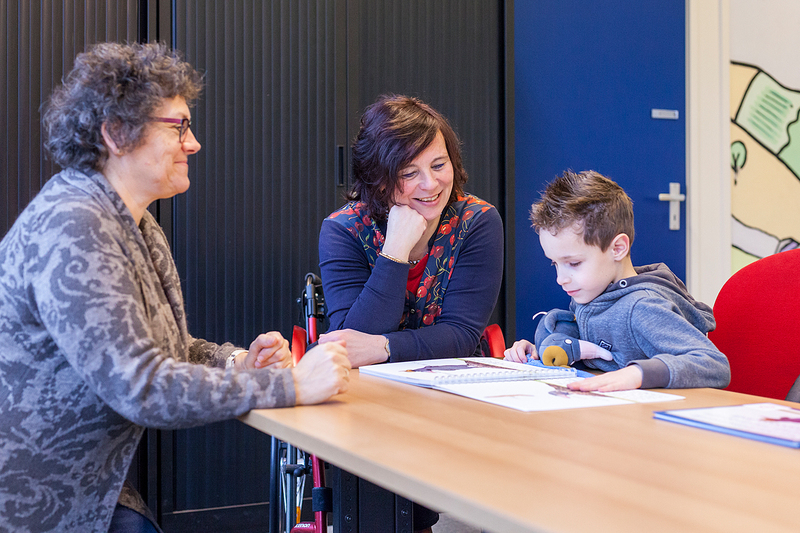 As solution we provide the original picture book with a reading manual for the teacher, a 3D object that is related to the story and a tactile picture book with tactile drawings in colour and the story in braille. Large-sized text is above the braille. 1. cuddly gorilla, 2. tactile edition with braille en relief illustrations, 3. reading manual and 4. the original picture book. The set includes plush mother and baby mouse. How do you read aloud with PicturebooksPlus? For introduction the child feels one or more three dimensional objects. These objects are related to the story in the book and facilitate the connection between the tactile illustration and the scene depicted. The reader reads out load from the original picture book. 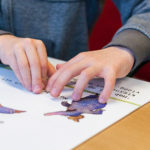 The visual impaired child has the tactile edition in front…In the reading manual there are general points of attention when reading aloud to visual impaired children and how to use the tactile edition. For each story there is a specific part of the reading manual giving reading suggestions per page. The suggestions are about text and illustrations and discuss body language, figurative language and visual language. Using these suggestions the reader can deepen and explore the story with the child. For each spread (two opposing pages) a part of the illustration has been chosen for the tactile edition and the illustration has been printed using a relief printing technique. 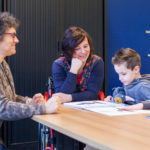 Some key words have been set apart and printed in braille and large-sized text. 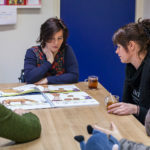 The purpose of the tactile illustrations is not a tactile exercise, but to support an interactive discussion about the story. BODY LANGUAGE Why is Mole standing hands-on-hips? Sven just scanned the illustration and imitates the posture.